“ … in that very hour when he was thus wickedly murdered in the sight of the sun, he had as great a share in hearts and affections of his subjects in general, was as much beloved, esteemed and longed for by the people … as any of his predecessors had ever been”. On a cold January morning in 1649, upon a high scaffold beside the Banqueting House in Whitehall, King Charles I met his death under the headsman’s axe. The event itself is well recorded, although Clarendon in his History of the Great Rebellion could not bring himself to include any details – the memory was clearly too painful. Eyewitness accounts tell that the fall of the axe was followed by a loud groan from the crowd, almost as if they had believed that the execution would not actually be carried out. The day was undoubtedly one of high drama. Even in an age well used to public executions this was an exceptional event. No English monarch before or since has died in such circumstances. The execution can be interpreted as a supreme example of power politics, the due process of law, a saintly martyrdom or the inevitable consequence of the King’s intransigence. It is clear that the King’s own attitude towards the verdict and sentence of Justice Bradshaw’s court was fatalistic – perhaps he felt he was being punished for his weakness over the execution of Strafford, his chief advisor, some eight years before in 1641. We could argue about the jurisdiction of the court and the legal meaning of the charges laid before King Charles, as he himself did most eloquently, but the process took its course and the outcome was one of the most infamous and dramatic events of English history. 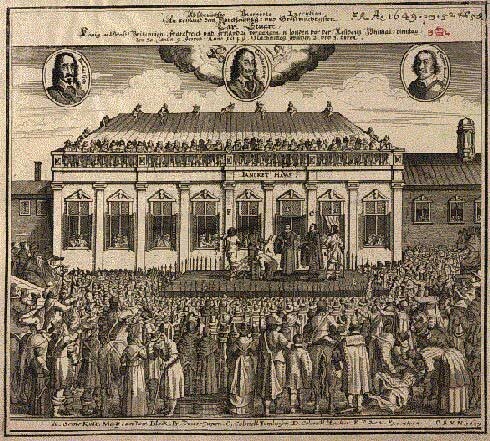 This Dutch print showing the execution of Charles I is not accurate in its details but was one of many similar engravings produced at the time. The trial of King Charles I, an extraordinary political and legal process of a kind unprecedented in English history, is well recorded in text and film. C. V. Wedgwood’s The Trial of Charles I is unmatched in print, and the scenes of the trial involving Alec Guinness and Stratford Johns in Ken Hughes’ film Cromwell are highly convincing. The view that the trial was a clear case of judicial murder is difficult to refute. It was probably the first historical example since Roman times of the “show trial” of a head of state and it was certainly a most difficult event to stage. Although the power of Parliament prevailed, the public relations aspect of the trial was, at best, a draw. Many who witnessed the proceedings were unconvinced of the prosecution case and the issue caused great unease in the country at large. The King’s performance in his own defence was impressive. On the battlefield Charles had regularly demonstrated a quiet courage and it did not desert him here or on the scaffold. Charles showed various signs of fatalism about the manner of his death. As a deeply religious man with a keen sense of divine providence, he blamed himself for episodes of weakness before the civil war. In particular, the death of Strafford weighed heavily on his conscience, rather more than the greater violence of the civil war itself, for which he felt no personal responsibility. One can debate the “cruel necessity” of the execution but given the way the day progressed, there can be no doubt about the mental cruelty that Charles was forced to endure. Charles had spent the days of the trial at the house of Sir Robert Cotton in Whitehall but had been moved back to St James’ Palace (out of earshot) on 28th January while the scaffold was constructed. The following day was marked by a most difficult last meeting with his two younger children. Princess Elizabeth and Prince Henry had been in the hands of Parliament since the beginning of the conflict and Charles had not seen them for fifteen months. The thirteen year old princess was extremely distressed but Charles wished to impress upon her his instruction to her brother James to offer his full support to the Prince of Wales during their exile. Charles’ messages to the younger Henry were naturally in simpler terms but he wished to ensure that the prince would resist any attempt to be crowned king ahead of his elder brothers. The pain of this parting can be well imagined. Observers expected the princess to die of grief within the week. Charles would have reached the Banqueting House well before eleven o’clock but there was clearly some delay. His mental anguish was to be extended by two critical pieces of legal bureaucracy that had been neglected until that very morning. The first concerned the death warrant. There had been trouble immediately after the trial in persuading enough members of Parliament to sign the death warrant and much coercion had been necessary. Now the three officers presiding over the execution also needed to sign the warrant and Hercules Hunks refused. Despite a protracted argument, this technicality was never completed and the omission was subsequently concealed. Secondly, it had dawned on someone that there was nothing to prevent the immediate succession of the Prince of Wales on the death of the king. It was even suspected that Abraham Reynardson, the Lord Mayor of London, would give this declaration official blessing. 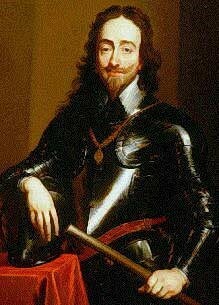 Hence the morning in Westminster was occupied by the reading of a bill making the proclamation of a new king illegal. It was just before two in the afternoon when the King was finally summoned to the scaffold. He was conveyed through a window onto the platform and immediately noted two things which dismayed him. There were so many soldiers surrounding the scaffold that his planned address to the assembled crowd would not be heard. Also, the beheading block was a mere eight inches high, so that he would have to lie prostrate at the feet of the executioner, and staples had been hammered in nearby so that he might be tied if he refused to submit to his death. Even so, the King made his short speech to those gathered on the scaffold. He expressed his innocence of the charges and of causing the conflict but also prayed that God would forgive those who had brought him to his death. Charles framed his testament in terms of his understanding of the duties of kingship. Hence he felt that he could have conducted his affairs in no other way and would become “the Martyr of the people”. He concluded by professing himself as a Christian of the Church of England. He made some final remarks to Bishop Juxon saying, “I go from a corruptible to an incorruptible crown” and his final word to the Bishop was “Remember”, presumably so that his words could be accurately conveyed to the Prince of Wales and others.